Welcome to Day 4 of our 5 for 5 Christmas Blog Event. Today our theme is a "Tag." We are all sharing a project where we used a tag. Each day our 5 Designers will post a Christmas Inspired Project based on a theme. Some of us are offering prizes, so be sure to visit all the links below and leave comments. This was a super fun mess but I loved the outcome!! I used a white gesso, streaked on with a credit card. Then after it dried, I smeared on blue teal Fantasy Moon by Pebeo. After it dried I added rub-ons, stickers, tinsel ribbon and glitter washi tape! Had so much fun! Be sure to visit all the other amazing 5 for 5 posts! There are a ton of inspiring projects!! Love the sparkle! Pretty tag! This is just dazzling!!! 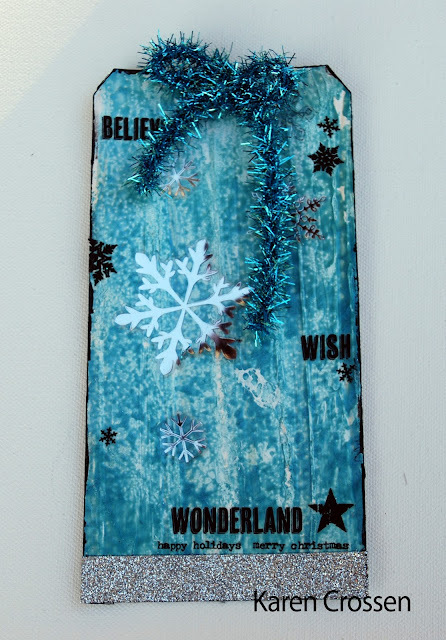 I LOVE the tinsel ribbon and the colors!! Ooooh, I LOVE this Karen. Its SO PRETTY!